ACB and HFI ink partnership to promote business and biodiversity (left to right) Ms. Vanessa Carriedo, ACB Communication and Public Affairs Head; Dr. Berthold Seibert, ACB partner and Programme Director of the GIZ CARE4BioDiv Programme; Atty. Roberto V. Oliva, ACB Executive Director; Ms. Ma. Fe Perez-Agudo, president of HFI and president and CEO of HARI; and Mr. Renato Pizarro, HFI Executive Director. 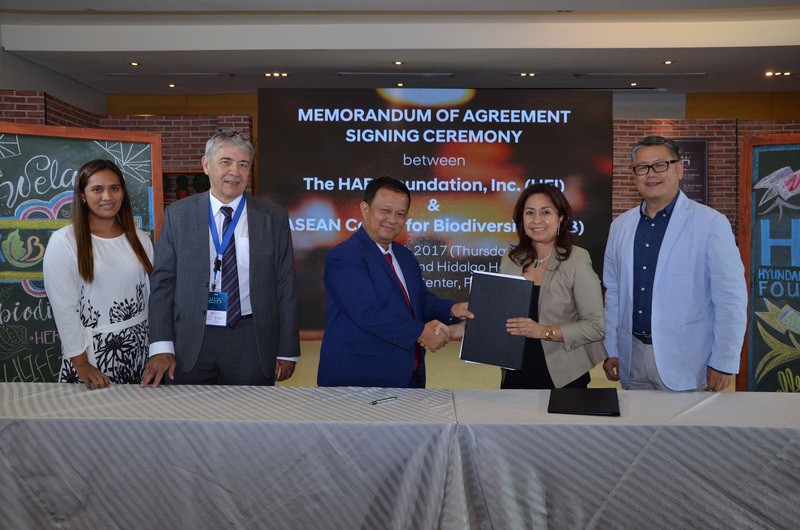 The ASEAN Centre for Biodiversity (ACB) and HARI Foundation, Inc. (HFI) signed a memorandum of cooperation on 30 March 2017 in Manila, Philippines to pursue joint initiatives that will strengthen business and biodiversity efforts in the ASEAN region. HFI is the corporate social responsibility arm of Hyundai Asia Resources, Inc. (HARI). “Joining hands with HARI Foundation is an important milestone for the Centre as the partnership signals the greater involvement of the business sector in global efforts to conserve biodiversity. This partnership will serve as a platform to generate awareness on the intricate link among biological resources, the economic well-being of industries, and the people who depend on these businesses for livelihood,” Atty. Roberto V. Oliva, executive director of ACB, said. He added that promoting public awareness of biodiversity by partnering with key sectors such as business, the academe, and media is a key mandate of the ACB. “We are supporting the Global Partnership for Business and Biodiversity, a worldwide campaign to engage the private sector in preserving the natural foundations of life for future generations. We welcome HFI as a keen supporter of this campaign,” Atty. Oliva explained. “At Hyundai, we understand that it is in the best interest of companies to take into account the value of biodiversity in our systems. Promoting the role of business in biodiversity preservation through smart partnerships and supporting activities that seek to mitigate the impact of climate change are part of HFI’s key advocacies,” Ms. Ma. Fe Perez-Agudo, president of HFI and president and CEO of HARI, said. “This partnership is also in line with HFI’s vision to build a climate change-adaptive and resilient nation where every Filipino responsibly protects and preserves the environment,” she added. Under the MOC, HFI will support the ASEAN Biodiversity Heroes, a project designed to recognize outstanding individuals from the ASEAN Member States who have contributed significantly to biodiversity conservation and advocacy efforts in their respective countries and the region. Partners for the ASEAN Biodiversity Heroes also include the Philippines’ Department of Foreign Affairs, ASEAN, and the European Union. HFI will also help build a Biodiversity Knowledge Hall at the New ACB Headquarters. The hall will be a knowledge hub that will showcase best practices in biodiversity conservation covering various thematic areas such as climate change, business and biodiversity, protected area management, and biodiversity information management, to mention a few. It will also serve as a venue for innovations forum, capacity building activities, and conferences on biodiversity conservation. In addition, HFI will also support the Adopt-an-ASEAN Heritage Park Programme which seeks to protect areas of high conservation importance which preserve a complete spectrum of representative ecosystems in the ASEAN region. Another project is the Hyundai New Thinkers Circuit (HNTC) which HFI undertakes with the Department of Science and Technology-Science Education Institute (DOST-SEI). Through this program, outstanding high school students are inspired and trained to become future climate science experts through a scholarship program that covers courses like Geology, Marine Science, Biochemistry, among others. HFI also organized a business and biodiversity forum that focused on what the business innovation can contribute to biodiversity conservation. Other projects include the HARI EcoVan, a fully-customized classroom-on-wheels built for HARIBON Foundation to promote biodiversity. “Partnering with like-minded organizations like HFI brings us a step closer toward achieving target 1 of the Strategic Plan for Biodiversity 2011-2020, which states that by 2020, at the latest, people are aware of the values of biodiversity and the steps they can take to conserve and use it sustainably,” Atty. Oliva said. For more information on ACB and HFI, log on to www.aseanbiodiversity.org and www.hyundai.ph. HFI supports the ASEAN Biodiversity Heroes project (left to right) Ms. Ma. Fe Perez-Agudo, president of HFI and president and CEO of HARI; and Atty. 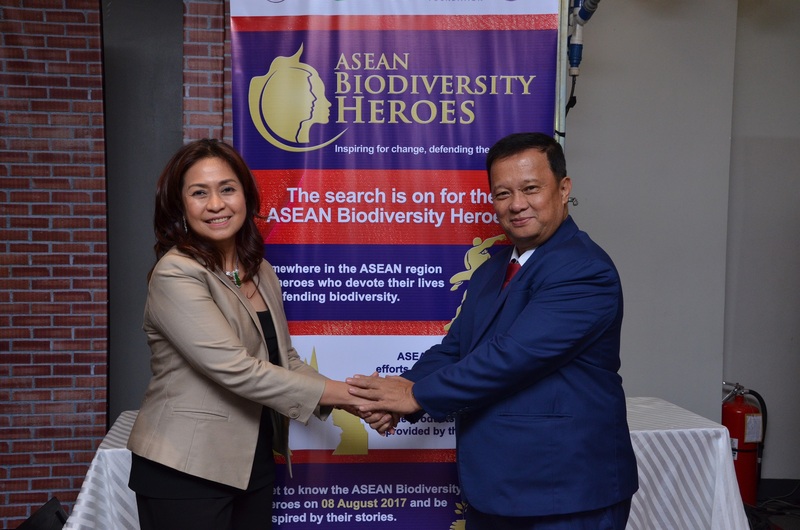 Roberto V. Oliva, ACB Executive Director firmed up their partnership for the ASEAN Biodiversity Heroes.